The 2004 Topps Star Wars Heritage set includes cards from the first 6 movies and for the first time in trading card history, collectors had a chance at getting a retail issued autographed Mark Hamil card inserted at a rate of 1:6,824 during the wave 1 release and 1:6,980 during the wave 2 release. This set was printed using the same style used in the original trilogy card sets complete with bubble gum but wrapped to prevent marking the cards. 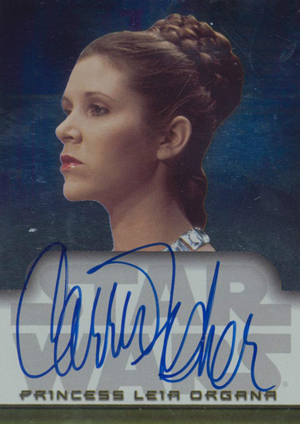 Autographed cards from this set remain a favorite for most card collectors with premium autographs by Mark Hamil, Carrie Fisher (rest in peace princess) and James Earl Jones, the legendary voice behind Darth Vader.